I used my sysbench 0.4 fork and set the value of the c column to 0 in the sbtest tables as that column is incremented during the test. 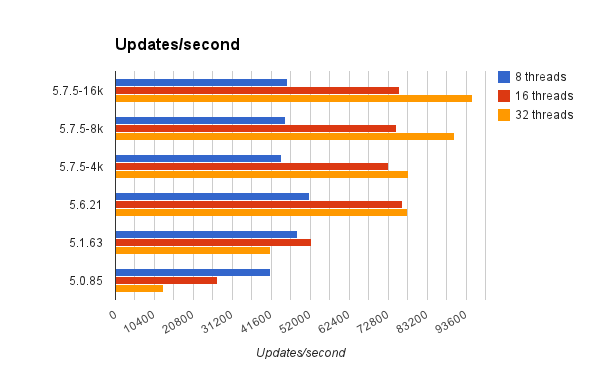 The test used 8 tables with 8M rows per table (about 16G total) and the InnoDB buffer pool was 32G. One table was used for the 1 thread case. For the other tests the clients were uniformly distributed across the 8 tables. All data was in the buffer pool at test start. The test was run for 10 minutes at each concurrency level (1, 8, 16, 32 threads). Throughput appeared to be stable throughout the test. Tests were run for MySQL versions 5.0.85, 5.1.63, 5.6.21 and 5.7.5. 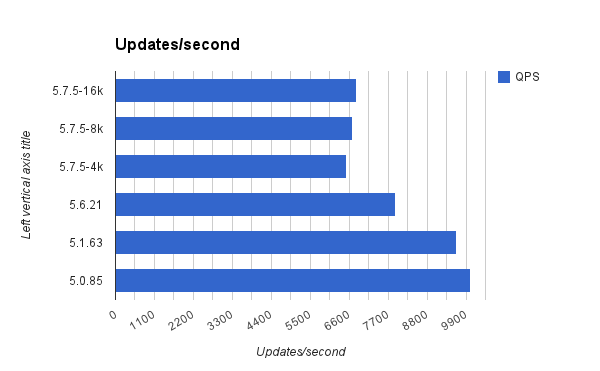 Tests were repeated for 4k and 8k innodb_page_size with MySQL 5.7.5 (see -16k, -8k and -4k below). Tests were also repeated with changes to innodb_flush_neighbors (=0), innodb_write_io_threads (=8), innodb_page_cleaners (=4) and innodb_purge_threads (=4). Results for those changes are not provided here as there wasn't an impact on QPS. The change to flush_neighbors reduced the InnoDB page write rate, which is a good thing. The regression from 5.0.85 to recent versions is visible in the single-thread results below. MySQL 5.7.5 is the champ at 32 threads but is slightly worse than 5.6.21 at 8 and 16 threads. Recent versions are much better than old versions.